Olivia Termini (environmental studies, classical studies) is wringing the most from her Dickinson experience, as captain of the soccer team, Montgomery Service Leader, Athletic EcoRep, Carlisle Borough student rep and cantor for Dickinson’s Catholic Ministry who's also a student member of two Presidential Commission on Civic Engagement committees and the Dickinson Sustainable Investments Group. She’s also studied abroad in England and served two summer internships in the federal government. Below, she discusses what she learned at the Environmental Protection Agency and on Capitol Hill, plus her early environmental activism, her community-based research, her advice for new and hopeful Dickinsonians and more. Environmental studies and classical studies. Varsity women’s soccer (captain), Montgomery Service Leaders, Presidential Commission on Civic Engagement Mellon and Academic Committees, Dickinson Sustainable Investments Group, Alpha Phi Omega, Carlisle Borough Representative, Dickinson College Catholic Ministry Cantor and Athletic Eco-Representative. Federal Bar Association Younger Lawyers Division 2017 Summer Law Clerk Program, Dean’s List, John Montgomery Scholarship, Eta Sigma Phi, Alpha Lambda Delta, Centennial All-Conference Team 2016 and Centennial Conference All-Academic Honor Roll 2016 and 2017. With a lot of help from my mom, I determined that a liberal-arts college was the right choice for me. Going through recruitment for women’s soccer, I was recruited to Franklin & Marshall first, then I looked at Gettysburg and finally made it to a Dickinson clinic the summer before my first year. The coach called me to tell me she was very interested in having me join the Dickinson community, and after I went on an overnight visit to Dickinson and met with staff from the environmental studies department, I knew I finally found my place. One of the reasons I chose Dickinson was because of its reputation for a robust environmental studies program. I dove right in and declared my environmental studies major in the second semester of my first year. I love having hands-on experiences in the classroom and activities that supplement my major, including work with the Center for Sustainability Education and the Montgomery Service Leaders program, through which I worked with the Central Pennsylvania Conservancy. As for the classical studies major, I began taking Latin during my first year to fulfill the language requirement. Four semesters later, I took an ancient philosophy course with [Professor of Classical Studies] Marc Mastrangelo, and once I learned that I could double major by choosing a study-abroad program that let me study the classics, I declared. I learned to adore the classics despite my love-hate relationship with the Latin language. Classical literature and authors have shaped Western civilization and have a heavy influence on several modern democracies. The combination of my majors is the study of humanity: the wants, the needs, the behaviors, the motivations, how we organize, etc. This unique combination is teaching me both the ideological views of Western civilization and a pragmatic approach to tackling governance from a sustainable perspective. I once had a friend tell me that she was surprised by how personable Professor Mastrangelo was when she met him. He's an all-around fantastic person and professor. He meets students “where they are,” shows the practicality and applicability of the classics and will do whatever he can to make sure you are healthy and happy. He genuinely cares about every student he teaches. Dickinson is a hub of intellectual curiosity with a small-town-community twist. I can accurately impersonate Dora the Explorer. My sophomore year, I took [Center for Sustainability Education Director] Neil Leary’s SUST 301 Building Sustainable Communities, Community-Based Research course. My class researched the community resiliency of Carlisle. We collected quantitative and qualitative data about a series of topics, including health, infrastructure, economy and government, and we inputted our data into a tool called the City Resilience Index (created by Arup with support from the Rockefeller Foundation). I thoroughly enjoyed the intensity and applicability of this class. We met with community partners and attempted to help them answer questions about the strengths and weaknesses of our community. The next semester, I worked with Professor Leary on independent research based on the resiliency research. After my appointment to the Presidential Commission on Civic Engagement, I became plugged in to the effort to expand the amount of community-based courses that Dickinson offers. The first half of this summer, I worked with Associate Provost for Civic Engagement and Academic Affairs Shalom Staub on a Community Impact Assessment; I interviewed 45 Community Partners for feedback on our curricular and co-curricular programming. Now, I'm developing independent environmental studies research on stormwater management as a project with the Carlisle Borough. This series of experiences has allowed me to pinpoint my academic area of focus to issues of sustainability and civic engagement. Serving as an intern in the federal government these past two summers. It has been an honor and a privilege. I studied abroad in Bath, England, with the Advanced Studies in England program. My highlight was my weekly Latin tutorial in Oxford with Dr. Elizabeth Sawyer. Through an internship with her for the grassroots organization ACT4Oxford (Aerial Cable Transit for Oxford), I helped coordinate an educational seminar for key Oxford stakeholders. I also had the opportunity to develop a paper about religious sentience in Virgil’s Aeneid in relationship to the natural landscape. Last year I interned at the U.S. Environmental Protection Agency (EPA) Office of Enforcement and Compliance Assurance's Honors Law Clerk and Clinical Legal Education Program. I was placed in the Planning, Measuring and Oversight Division. Primarily, our work focused on enforcement of certain aspects of three environmental statutes and assessing the work of our entire department. I learned the ins and outs about how a governmental agency works. It was especially unique because I was there at the time of a presidential transition. I was comforted by the diligence and fantastic work of the civil servants at the EPA. Our governmental system does not favor change, so even with top-down changes to legislation, there are still environmental statutes that will continue to be enforced in perpetuity, and I was surrounded by the men and women who work every day to make sure that continues. During my experience at EPA, my advisors told me that I should take my energy and enthusiasm to the Hill, and I took their advice. 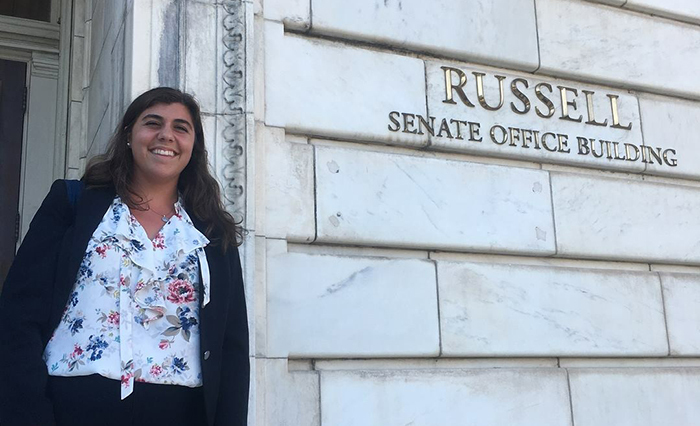 This summer I am administrative and legislative intern for Senator Robert P. Casey of Pennsylvania. I love how different my day-to-day experiences are. Besides administrative tasks, including Capitol tours, digital and tangible mail sorting and signature fetching, I work on community and economic development issues. I am working on letter drafting and developing an independent research project. I'm also excited to participate in the annual Keystone Cup, a softball game on the National Mall vs. Senator Toomey’s office, as well as in seminars offered by senators, business professionals and nonprofits. In a political science class I took during sophomore year, [Assistant Professor of Political Science] Kathleen Marchetti once stressed how difficult it is to gain access to the political process. This stuck in my brain, and it makes me even more grateful to have an insider view of our government at the federal level. Termini's internship experience was supported by a Dickinson internship grant. Learn more about internships at Dickinson. I'm interested in graduate study related to environmental governance or fellowships that relate to civic engagement and sustainability.